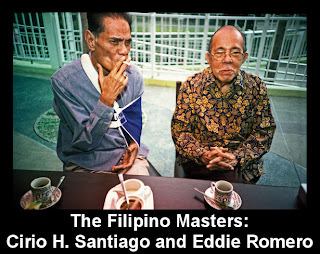 When Philippine cinephiles speak of a Golden Age of Filipino cinema, they refer more often than not to the Fifties, and of a film industry dominated by a studio system in which the independents are sidelined. Since its inception in the opening decades of the Twentieth Century, the Filipino industry was, is and perhaps is destined to be, a Microcosm of its inspiration: Hollywood, the Macrocosm. The dominant Big Three studios (Sampaguita Pictures, presided over by the Vera-Perez family, and LVN Productions by a consortium including the de Leons) were a miniaturized version of Hollywood's Big Eight in the Thirties: dynastic studio heads reign supreme over their own extended family AND the major filmmaking families. 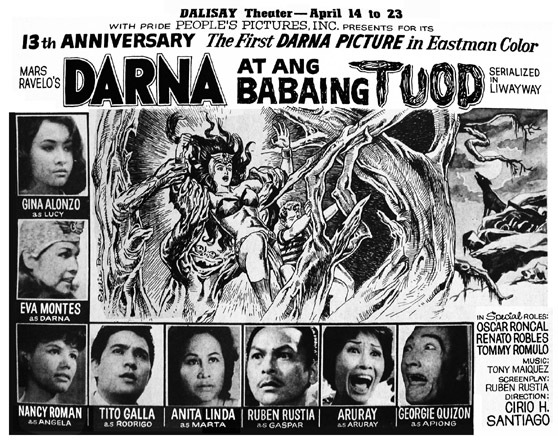 Premiere Productions emerged in the post-War period as one of the Philippines' three largest production houses. Cirio H. Santiago had grown up in the studio owned by his parents and in 1957, aged only 21, had enough business acumen to forsee the grim future for the Big Three studios. Of particular interest to Santiago were the opportunities to be made in the lucrative and ever-expanding American drive-in circuit. 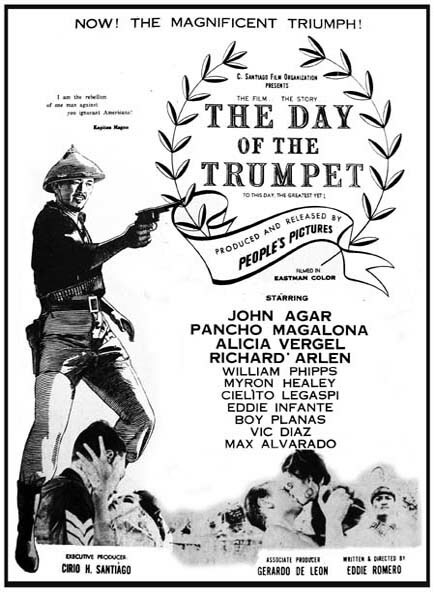 With dreams of taking his films to the world's screens, and with the American drive-in circuit firmly in his sights, Santiago took a huge financial risk for Premiere: along with Eddie Romero, he set up the Philippines' first production, The Day Of The Trumpet (1957), for the international market. Santiago himself continued to pursue a career in the international whilst keeping Premiere Productions afloat. By the early Seventies Premiere began seeking out co-production deals with countries including the United States; Premiere, one of the Big Three studios of the Fifties, was rapidly evolving to become primarily, though not exclusively, a production unit for international features and co-productions including those of Roger Corman. In Corman, Santiago found the perfect partner in crime, and would continue a working relationship and close friendship from their first meeting in 1970 until Cirio passed away in 2008. This is Cirio’s story in his own words, from my one and only meeting with Cirio at his Premiere Productions’ office in Ortegas in 2007. It was planned to be the first of many discussions, but as fate would have it, Cirio was already ill with lung cancer. 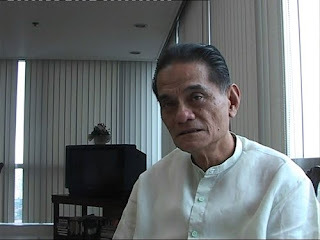 He kept up a gruelling work schedule to complete his final film with Roger, Road Raiders (as yet unreleased), but sadly the busiest filmmaker in the Philippines passed away mid-shoot. Cirio: That was for local release. After that I expected the market to shrink, so I explored the foreign market. That’s when I started making films for Roger Corman, for AIP and MGM. That’s when I went to LA. It was tough, because at that time Orientals were not welcome in Hollywood, and it’s a fact. John Woo and the other guys are lucky now, Orientals are accepted. Even Australians were not accepted then in the early days, Sixties and Seventies, until the big films, the big Australian film that won Cannes and a lot of festivals all over the world, THAT’s when the Australians started coming. 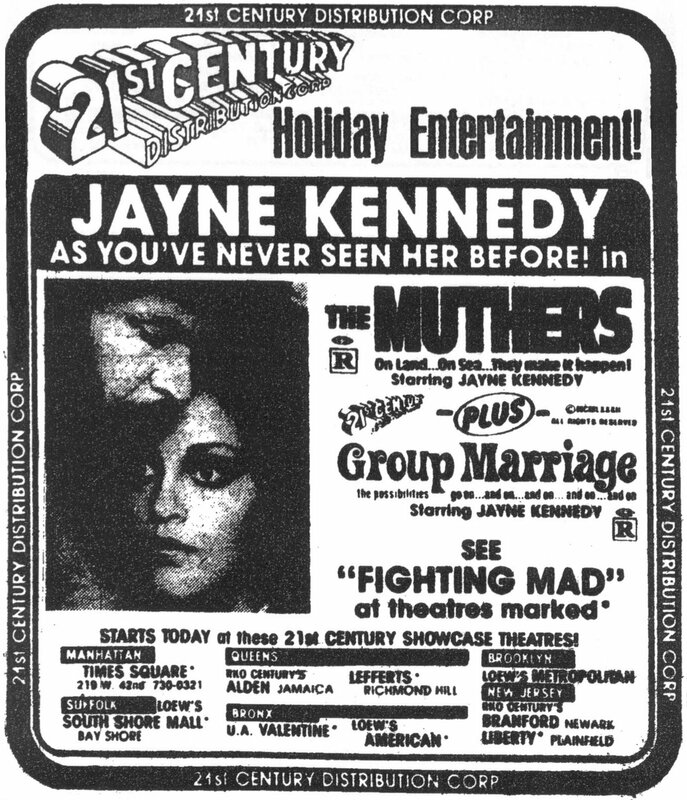 After Mad Max (1979), that’s when Kennedy-Miller entered the market. I did a film similar to Mad Max called Stryker, because I saw it in LA, it was doing well, and I was wondering how come nobody is making any of that genre. So I started with a film called Stryker (1983), I did six of them. Raiders Of The Sun (1992), Dune Warriors (1991)…it’s all Mad Max. And the market took it. And I was lucky we did it. My first films were all women in cages that we did in the Seventies. That’s how I entered LA. The drive-in theatres were still available then, we were going straight to the drive-ins, and that’s the success for our products. 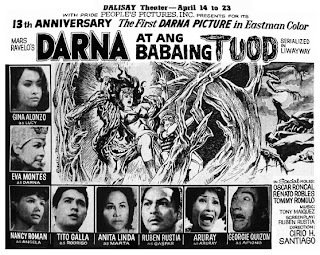 Apart from a few co-productions, Filipino film companies didn’t really try to export their own films. You’re one of the pioneers of producing films in the Philippines and then taking them to the world – would you say that’s a fair comment? Yes. Originally Eddie Romero and myself were doing that, joint venture. We did not make anything on that. It’s tough. We cannot export Filipino films to the world market. That’s the wrong motion. You have to make films here for the foreign market, and the foreign market is different. 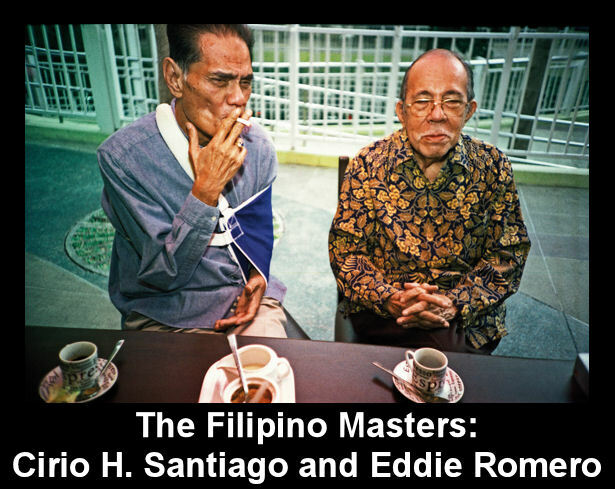 Filipino films unfortunately cannot be sold to the world market. You cannot go to a festival and bring a Filipino film dubbed or subtitled, it’s impossible. Not the quality. Our local films are different taste-wise. We’re slow, we’re very Oriental. It’s typical for us to say goodbye, it takes five minutes. Australians and Americans will take ten seconds, “See you later…” But Filipinos and Japanese, Orientals, when you say goodbye, “My best to your family, your neighbour, your uncles…” That’s the pace of our films. And of course the audiences enjoy slow-paced films. When you go to that market after part one, the buyer will njot touch them. It’s not possible, I don’t believe in it. So when I went to LA, I wanted to make American films. That’s what I did – scripts written by Americans. And I was fortunate I was given a break to direct. I directed 27 American films already, and now I have a contract with [Sony] Columbia Pictures. I’m doing four films in two years – I’m starting with Sniper 4, I start shooting April 16. Then in November I do another Sniper, it’s a franchise. That’s where the market will be. Unfortunately how I wish Philippine films would be exported, but you cannot. Of course a lot of guys want to export our films. I cannot sell abodo or my food to Australians or Americans, they still prefer steak, hotdogs and hamburgers, so you have to make them that. I love my Filipino food. But films are like food for the soul. You cannot sell it unless you go to Venice, that’s not the market commercially. Economics, you cannot fly. You said something that we tried to sell it [in the Sixties] – we tried, but I don’t think it will succeed ever. You’re saying the most successful films sold to the market were designed for Americans? …American films. Platoon was made here, we put that together. That’s the product you have to sell. I love to sell my culture, but…let’s face it, nobody cares about our culture in the Eurasian market. Your country’s lucky, you have great Australian directors, and New Zealand is being used now. You’re lucky, but I don’t see it happening here. In other words, something that is a Filipino cultural phenomenon such as Darna would not translate outside the Philippines? But Darna is a copy of Wonder Woman! How can I sell Darna outside? You cannot. The CGI, they’re better. And no matter how hard we try, we cannot beat the CGI of LA. The thing I’m thinking of is if we do a joint venture, say the story of Bataan or General Pershing, but again it will not sell because I’ve been pitching that in Hollywood and there are no takers. Andrew, when I make a film, I make a film that I’m guaranteed distribution. Before I used to crap shoot: our own money, we’d do it, then go to LA and crap shoot. That’s not successful. But I have a lot of young kids who are still willing to do that. I don’t want to kill their dreams, but I advise them that it’s tough. If you and I make a film for half a million pesos or dollars, it’s tough. The market is tougher now than before because the majors took over everything. In the Seventies we could still have our own distribution company and go to drive-ins. Then in the Eighties it was the advent of video, that opened the market. But the American majors took over the video market, everything. It’s a tough market. But there’s a new thing that’s coming up in Hollywood, Video On Demand. I attended a meeting, that’s a possibility. And again you have to make films for that market. I can’t do a film that an Australian gentleman comes to America, has adventures etc. It has to be patterned after an American story. That’s it. Quentin Tarantino is a good friend of mine, we’re very close. In fact I’ll be directing with him next year. He told me, “You’re the only director who did a genre [film] on women in cages, then a Mad Max, then a Vietnam genre.” I made about 17 films of these different genres. Quentin told me, “Cirio, you’re the only guy who has this record for twenty years!” After Platoon (1986) I packaged together, we did a lot – Final Mission (1984), Firehawk (1993), and they were all released by Corman. 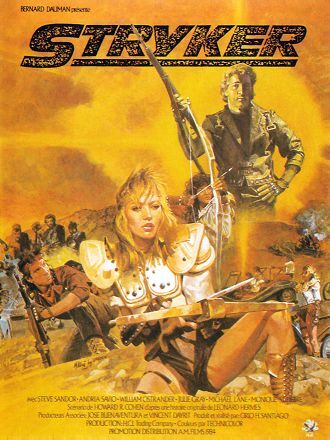 I did some films in between – Naked Vengeance (1985), Spear Of Destiny (aka Future Hunters, 1986) and so on. What I want to do is make more films, but two years ago the market became tough for small films. Now I’m fortunate that Sony Pictures hired me for four films, and then I have a contract with them to produce or co-produce or direct. But right now I’m doing other projects, so I’m bringing in an American director to do Sniper 4. But eventually, the market for bigger films, we should focus on it. Henry told you the history of my films? Henry worked on almost all of my films – Assistant Director, extra etc. He’s a good man, very decent. Yes. I was tired after that! He had a beautiful way of describing you at work – he said it was like watching a General marshalling his troops, sometimes against almost insurmountable odds, and yet there’s a loyalty to the General that you’ll follow him no matter where he takes you. I’m lucky with the people that I selected. Some of them worked for my father, and their children, and I’m very fortunate with these guys. They don’t care about how much pay they get, but now I’ll be paying them more. Because I can! It’s now Columbia Pictures. The thing is, they’re very loyal, and because of my experience with them, and their experience with me, when I move to the left, they know what I want. Henry knows that. When I look up they know that I’m shooting the sky. And it’s so easy for me. When I did a hundred camera setups I had four cameras – it’s a battle scene. Before I charge in, I shot first my heroes, then I did the reverse. It was eight hour work, but at least we had the record. I wasn’t counting, I had no intention of going for the record, I just wanted to finish it because the budget is so. I noticed that in your filmography, the number of films for the international market start to drop off around 1994, ’95. Even the local market started to feel the effects of a general downturn in the mid 90s. The local films hopefully will not die, but they’re only making thirty films here. We used to make 250 local films [a year]. But the downward trend seems to have happened in the mid 90s? Yes, even in LA. Corman, API told me no more small films. Because what the majors did, they were doing our small films, but the difference is they put stars, and they put names on the box – and our films had no names on the box. So when you go to Blockbuster, you look for Seagal or Wesley, then I have “George Smith”, they don’t rent it. So that kind of product went down. Now it’s coming back, because Sony are using names, Tom Berenger, so they can sell, and they are willing to spend money. 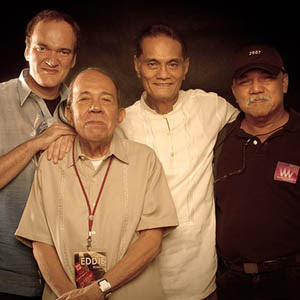 The fact that Quentin would even consider a Filipino part in his film surely shows his love of Filipino films? Yes, but the filmmaking itself is really good low-budget filmmaking. People forget that Eddie and Gerry are now both National Artists – these guys were great filmmakers, and those were technically good films. We’re doing a film, Quentin is writing a script about that era, that an American company is shooting a women in cages in Manila. That’s one of his projects. I said that we’ll do it. It’s fun – the problems behind, etc. We had a lot of problems shooting small films. We’re told you only have $85, 100 thousand, and when the money’s finished, go home. So shoot the beginning and the end, whatever happens… [Quentin] was laughing, he knows what happened. And he said, “I want to do a film like that.” Because Grindhouse is a double program. His is 90 minutes with Kurt Russell, Robert’s is 80 minutes, Bruce Willis is a guest. But his one is like The Fast And The Furious, it’s a racing car. I saw part of the dailies, it’s great. I hope it makes money. My comment to him on Grindhouse was, for Asia, they don’t understand the meaning of “grindhouse”. Even most Americans. I had to explain. He wants to go back to the Seventies with the double program. He’s definitely a fan. And your films have a following around the world; people get excited about the name “Cirio H. Santiago”. What do you put that down to? Well I’m humbled, I’m blessed. Sometimes I think, can you imagine the people who saw my name in my films? It’s awesome. I’m very happy, at least I have some legacy to leave. Not in the local films, because here I’m not that recognized, and I do not know why. Sometimes they say, “Ah, Cirio, he makes B movies.” I don’t believe in B movies. I don’t think the director, when you direct, and tell yourself “I’m going to do a B movie.” Low budget, yes. But when I go to myself, I don’t tell my people we’re doing a B movie. We’re going to do a GOOD film. That’s it. Of course the guys here locally, they say, “Cirio is only doing B movies.” Well, I’m not bothered. I hope they’re doing B movies, but unfortunately no-one’s doing B movies. Only Eddie Romero did it, Gerry de Leon I brought [along]. No local directors have directed for that market that I know of. And we were very fortunate. Yet this seems to be a timely moment. The Italians are shooting a zombie film in Paranaque, Bobby Suarez is about to start on Vengeance Of Cleopatra Wong for Bigfoot in Cebu, you’re making films for the Americans again – and this runs counter to the major studios here, Regal and Star Cinema, making films purely for the Tagalog market? Star tried to make two films, and Regal, they all lost money, that’s why they stopped. Bigfoot, I do not know. Bobby is a friend, a protégé, he’s a nice boy. I do not know the plans for that. When you make a film, I always say you must have guaranteed distribution. Maybe Bigfoot can afford to crap shoot; I only know Bobby is a competent director. I hope more Filipino filmmakers can do films for the export market. But like [when] I talk to Regal, they say “Cirio, how long will it take for us to recoup our money?” I said eighteen months. They don’t want it. Because if you make a local film, you recoup it in three months. When they show it in Manila and all over the Philippines they get back their money, they don’t want to wait eighteen months. But you have to wait eighteen months. Like you were saying before, you need a guaranteed distributor, and you developed a relationship with Mr Corman very early on. Can you tell me how that came about? Sure enough, a month later he called me up, he said, “Cirio, we’re doing The Big Doll House (1971) with John Ashley. I’ll send you a script, can you do the budget?” I did a budget for $90,000. I sent it back, and said, “Roger, what do you want me to do?” “You don’t have to invest, I’ll give you equity. But do it for $90,000.” We did it for $87,000. Then I returned to him $3,000. Pam Grier was there, the start of Pam Grier, and it took off. MGM picked it up, that’s when the company [New World] started, and we became very close friends. He’s a nice man – he’s an icon! From then on AIP noticed me, Dimension noticed me, and so on. When I did Stryker in LA, it was a big, big hit. Then I did Final Mission. I was at a crossroads in my life. My agent told me to stay in LA and make bigger bucks, but I decided to come home because I can do other things for [my] country, and then I said I can still do films in Manila. That’s when I started making boom, boom…I used to make four films a year, one after the other. And I enjoyed it. 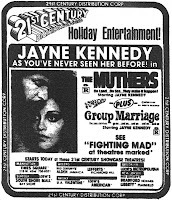 The Muthers is the favourite of Quentin’s black films. I said, why do you like it? He said, “Cirio, nobody has done four beautiful black women prisoners who escape from prison and become pirates.” That’s the story! I said I’m a big fan of Errol Flynn – he did Captain Blood, The Sea Hawk - and he was laughing. He has a film print! I said can you make me a copy? He’s doing it now. The Muthers I did for Dimension. He’s also sending me Ebony Ivory And Jade (1976) with Colleen Camp. Can you imagine when I met him, first time in LA, a guy tells me about my film? And when he met me, he had a disc of Savage (1973), my first black film. I signed it for him. He said, “How much did they pay you for this?” I said I got $3000 for directing that. He was laughing! It was fun. 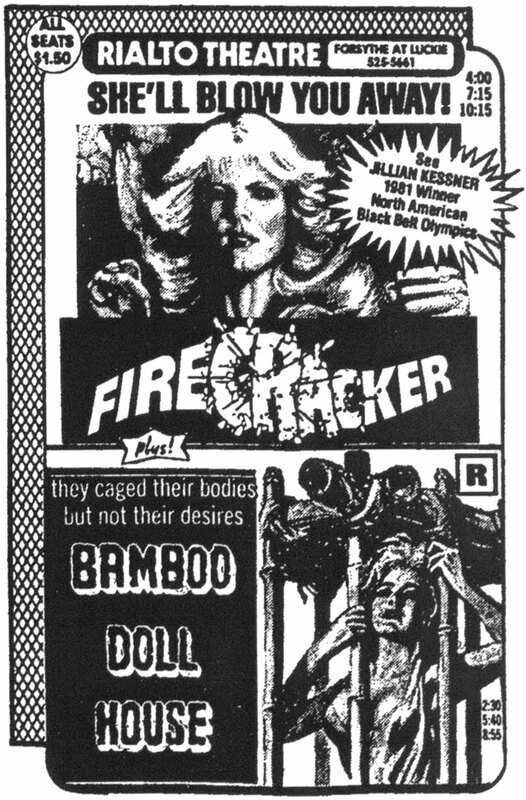 Talking about your early filmography, Fire Maidens Of Mora Tau was only ever an in-joke in Hollywood Boulevard (1976)? There are things on the [IMDB] that I’m trying to change. I did 37 films, I directed about 22. That’s a lot for a lifetime! Locally I directed about 38, 40. I still want to do local films. Was Paltik (1955) your first film? 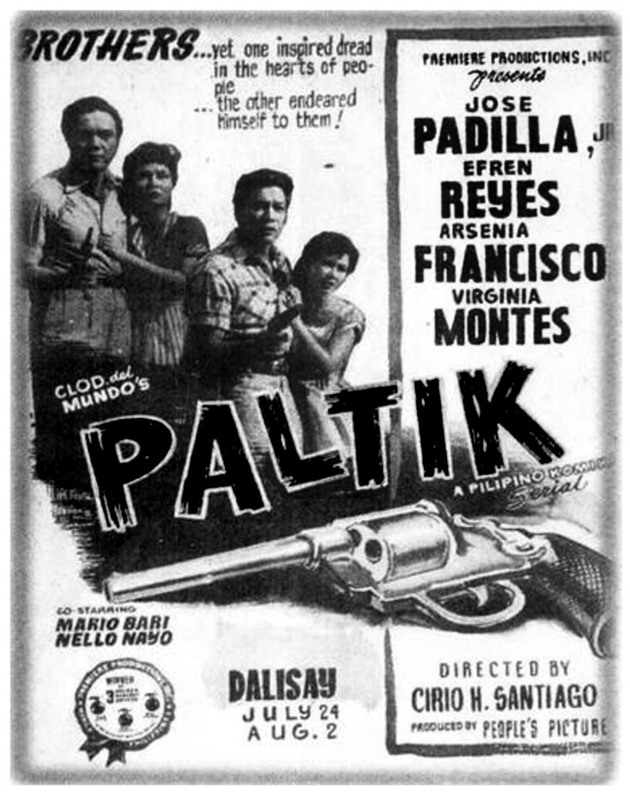 Paltik – it’s a gun. I was 19, I was still in college studying marketing and economics, and that summer I did my first film. I went to the toilet twenty times that first day, I was so scared! But you also grew up around film. I’m very fortunate my parents owned the studio. I learned from the masters. All the masters were directing, I was watching, and that’s how I learned. First, I want to recommend to future filmmakers, they should know how to write. I used to write for my college. And then you must know how to edit. An editor’s very important, though sometimes they’re neglected. When you learn in the editing room, you LEARN. That’s why David Lean said, “God creates a film in the editing room.” That’s true. Because if you edit, you don’t panic on the set. And you have the film all mapped out? In your mind. Because you know when you have your closeup, your dollies, your full shot. And if you know that, economically it’s better. I cut my films, but what I’ll do is this – I’ll tell my editor to cut my film, sometimes his version is better than mine. Sometimes when you shoot a scene or a sequence, in your mind it’s like this…I’ll tell my editor, cut it your way, sometimes they have a better version. Some day I’m sure you’ll want to direct. Everybody wants to make films. For $300,000 to half a million dollars you can make a quality film here, since the advent of HD. I’m shooting in HD. But if I may suggest, the concept must come from you – don’t let it come from the locals. Though I love my local kids! Corman just did a horror film, he brought Christopher Lloyd for $75,000 for one week, low budget genre. Now he can sell because he has Christopher Lloyd. You have to have a name. Sacrifice yourself to buy a name. Andrew, see how we work, because we work differently. I wake up at five in the morning, we have breakfast on the set, at 8 we must grind. Here, no – locally, the actor is late, he doesn’t know the scene, “What are my lines?” That doesn’t happen on my set. My actors breakfast at 7, we shoot at 8, and if he doesn’t know the lines it’s a problem. I did a lot of komiks. 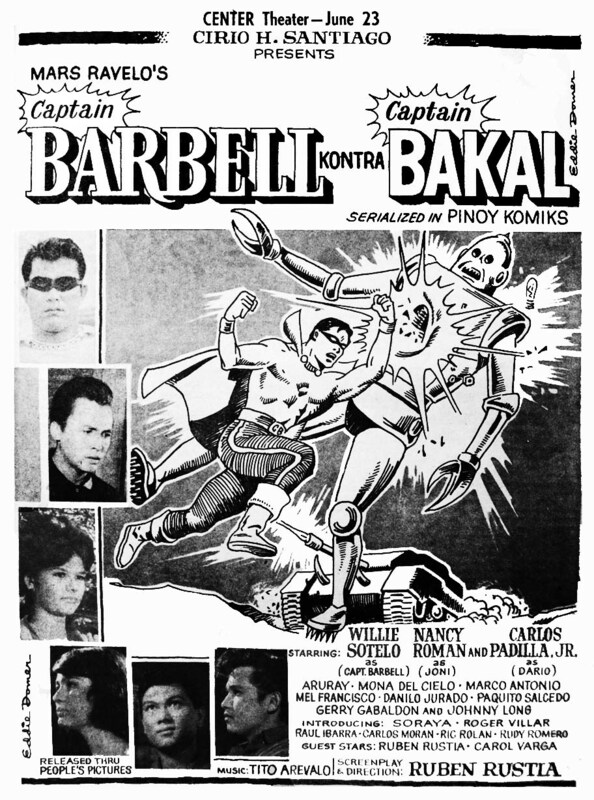 I noticed you produced a Captain Barbell film [Captain Barbell Kontra Captain Bakal, 1965]. We did a lot, komiks-wise. 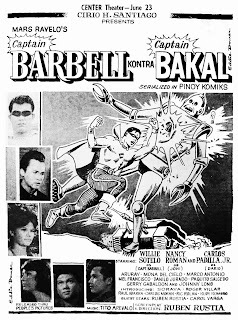 We did about twenty films based on komiks. They were all in the Sixties? Yes. That’s where people read the novels, and you buy the rights and then you film it. That’s how we did it in the past. Now, no more komiks, they’re not popular. Even in the States they’re just reviving Superman, Batman and so on. But now, no more komik pictures. They must be a hero to the poor, always. That’s the one that clicks. But some authors were wise then, because if they know my movie star, they write the story for them. 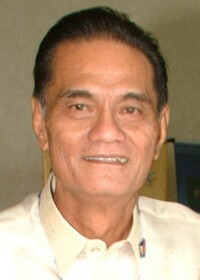 So when they come to me and the studio, they say “Cirio, I have a story for Fernando Poe Jr”, and we do it. And they never miss at the box office, because the guys read it, they want to see it on the big screen. That was in the Sixties, Seventies, not any more. Films now are not great. Some good films once in a while, but they don’t make better films unfortunately. It’s all economics. The passion’s not there anymore? When you were making films back in the Seventies and Eighties, obviously you weren’t getting paid a great deal of money. Was there a desire to make something out of very little? I had the passion to do it, and that’s very important. When you become a director some day, if you have no passion for a project, don’t do it, it’s useless. As I told you, all directors should go the set telling themselves “I’m going to make a good film today.” Because I don’t believe in bad intentions. I don’t care how good you are, if you have a bad script it’s almost a miracle to do a good film. The advantage of Quentin is that he writes well. I like his dialogue. The kids love it. Sometimes I don’t understand his style when I read the script. “I’m too old for that,” I told him, he was laughing. “Cirio, you directed black films and you understood the lingo!” I said sometimes I didn’t understand the black ling. I’d ask the leading actress, “What are you saying?” Because the lingo is different. He came from Tennessee so he had a lot of black friends. He understands it. The films you were making in the Seventies made icons out of black actors. Somebody wanted to do a remake of TNT Jackson (1974), but that’s Red Harvest. It’s the same story, the book, the Japanese made it, then Roger said “Let’s copy this.” And we did Red Harvest three times – TNT Jackson, Firecracker (1981), Angel Fist (1993). Same plot: an American girl comes here looking for her sister or brother, she or he investigates…and it worked. By the time Firecracker rolls around, the market has shifted from black and Asian leads to white faces, thanks to Chuck Norris. After Firecracker I did Live By The Fist (1993), Jerry Trimble – it’s a white guy now instead of a black guy. And after that I went desert, and then Vietnam. Do you remember Weng Weng at all? Weng Weng was a big star during the Manila [International Film] Festival. In fact at that market Stryker was there, and it wasn’t selling. 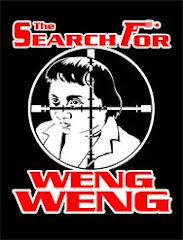 Weng Weng’s films were sold. I hoped they made money. What happened to Stryker, I was very fortunate – they were crazy about Weng Weng, but the big companies were not. J&M of London, and New World Pictures liked [Stryker]. It is an accident, that film is not finished, because if it was finished I could have sold it at the Manila Film Festival. I said it’s not finished, I don’t want to sell it – that was my pitch, but I was trying to sell it. The film cost me $250,000, so we did the post, and J&M, a big company out of London, said “When you go to LA, we’re interested…” They hit me with 25% commission. But they did this layout and they did the trailer, and it went to town, made millions. Weng Weng, I know the kid, I know the producer. I don’t know what happened to him. Did Premiere fund the shoots of your films, and you’d then sell the rights to Corman? No. America funds me. Premiere was not included, I rented their equipment. So they’re not Premiere productions, they’re New World , or whichever company released it? We’re used as a joint venture. We were paid a fee for the equipment, and I get paid as director, I get equity as producer. If it makes money I get a share. If it doesn’t make money I just get my salary. 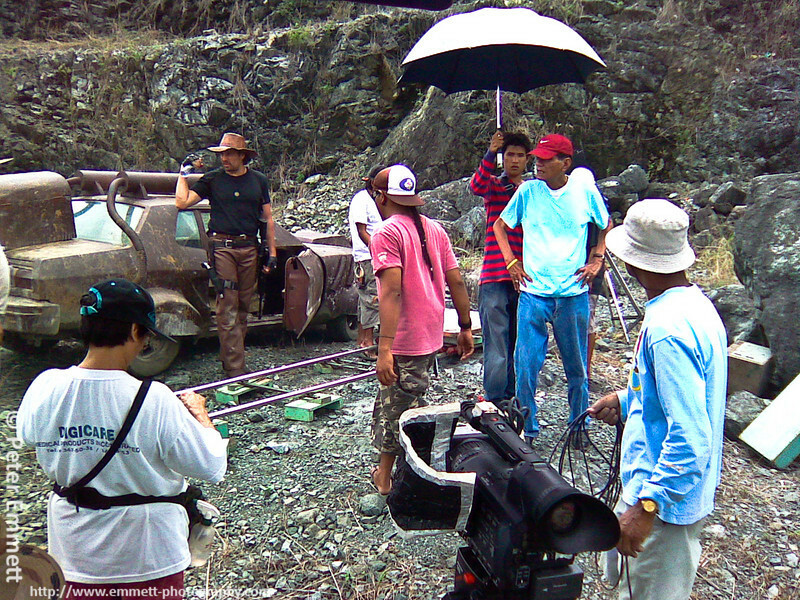 It’s very hard to get funds from the Philippines to make American films. When you do your thing, be sure to get money from Australia or wherever. Unfortunately I can’t find money here. Thanks for posting this. Great interview. Coincidentally, it took me ~9 months but I recently finished watching all of Cirio's post-apocalypse and vietnam movies, or at least the ones I am aware of. I'm a better man for it. Stupid question, but one I've wondered about: How is "Cirio" pronounced? Key-rio? See-rio? Fantastic interview. So many things I never knew. Wish he could have hit the mainstream! Can't wait to see WATER WARS. Trailer looks terrific. I still wanna go to the Philippines so badly to do a movie! Andrew, I'm just about to post about STRYKER over on my blog and it occurs to me that you haven't got an entry for the film! LOL. I've recently bought it from Kino Lorber (upgrading from my old fullscreen Greek vhs), and they've put out a very cool blu-ray in original aspect ratio.